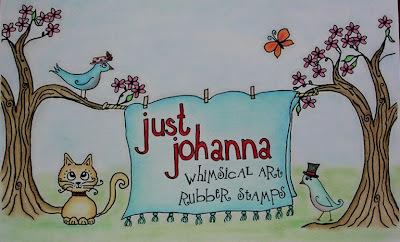 Anyway, Johanna needed a new cover for her catalogue and guess who got to design it (heehee)? I love putting these whimsical little images together to create stories. I'm not sure how I ended up with a blanket on a clothesline - except maybe it was my subconscious telling me I should be doing laundry instead of stamping and drawing! Your cover is SO good!!! It looks like it could be the cover for a good child's book too! Great job! Your work amazes me! Great job Cathrine!! The catalog looks great!